The Lok Satta Party today strongly condemned the attack on its national President Dr. Jayaprakash Narayan at Medchal on September 27 by some party workers in the name of Telangana when he was taking part in a non-partisan, round-table meeting on ‘surajya’ (good governance). In a media statement, Lok Satta Party leaders Katari Srinivasa Rao and P. Ravi Maruth said that all democrats should condemn those fomenting hatred and indulging in physical attacks. 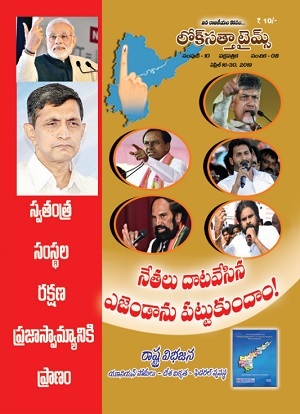 The leaders pointed out that he Lok Satta Party has unequivocally declared that it whole-heartedly welcomes the formation of Telangana State as part of an amicable and comprehensive solution. The Lok Satta Party has not indulged in double-speak in different regions or on different occasions. The leaders recalled that it was Dr. JP who first suggested that the Assembly discuss the Telangana issue and adopt a resolution requesting the Union Government to resolve the issue as soon as possible. At a time when some politicians commented that the Telangana movement had lost its intensity and momentum, it was Dr. JP who underlined that although passions might have cooled down, people’s agony remained intact. Dr. JP had demanded an early solution to the Telangana problem by pointing out that people of the region gave vent to their aspirations repeatedly, the latest occasion being the by-elections to the Assembly. The Lok Satta leaders recalled how Dr. JP has been striving to safeguard the interests of Telangana people. It was Dr. JP who took the initiative for deletion of Clause 14 F in the Presidential Order of 1975 dealing with recruitment to certain police personnel in Hyderabad. It was he who fought against diversion of the Godavari water from Yellampalli to Hyderabad and suggested that the water be utilized to meet the drinking water and irrigation needs of Telangana districts. He batted for Phase III of the Krishna water project to meet the drinking water needs of Hyderabad. Dr. JP got the Siddipet market yard opened and provided relief to cotton growers of the area. He launched a movement to ensure remunerative prices to cotton and paddy growers. It was Dr. JP who successfully fought for implementation of G. O. No. 610 in regard to teachers’ transfers in Ranga Reddy district. He sought revocation of Nizam Sugars’ privatization and campaigned for strengthening the banks of River Krishna. 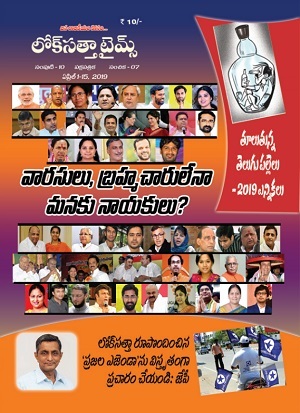 Mr. Srinivasa Rao and Mr. Ravi Maruth pointed out that top CPI, TRS and BJP leaders too have taken part in the surajya movement launched by the Lok Satta and Foundation for Democratic Reforms since it is non-partisan. Mr. Chennamneni Rajeswara Rao, freedom fighter and a walking encyclopedia on the Telangana liberation struggle, is steering the surajya movement unmindful of his age. They called upon all political parties, civil society organizations and democrats to condemn those who are spewing hatred and indulging in violence.